Moving the Stonehenge Bluestones: At last a successful method is demonstrated! 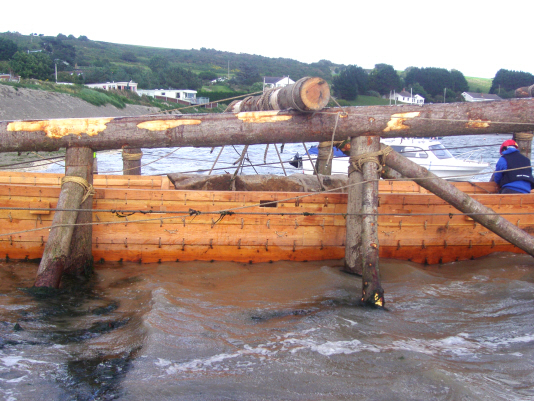 On the 15th August, near Poppit Sands, in Cardigan, West Wales, several skilled artisans showed how they would load a boat with a multi-ton bluestone. They did this with a force 7 on-shore gale battering the shore-line. 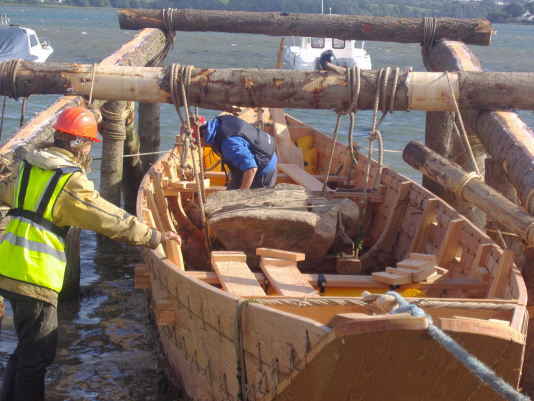 In the time it took for the tide to come in, a flawless lowering took place of a large bluestone onto a prepared cradle within a near-replica of the boat found at Ferriby during the early 70s. 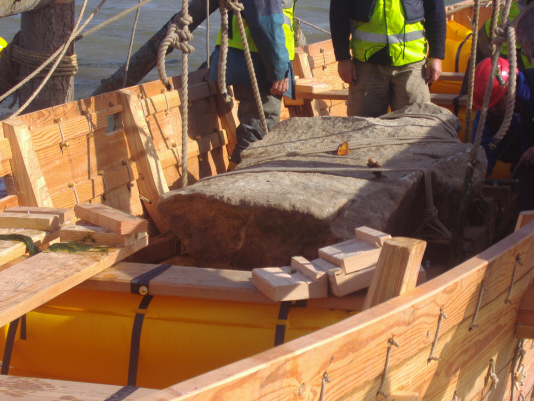 The Ferriby boat has been dated around 2000 BC, making it much too late for the period of bluestone moving (given at around 2700 – 2400 BC depending on which source one reads). But the boat is entirely believable as a design possible within the known technology of that period. Basically, if one can make Stonehenge, replete with mortice and tenon joints and tongue and grooving in stone, then one can make planks and joints in wood!. 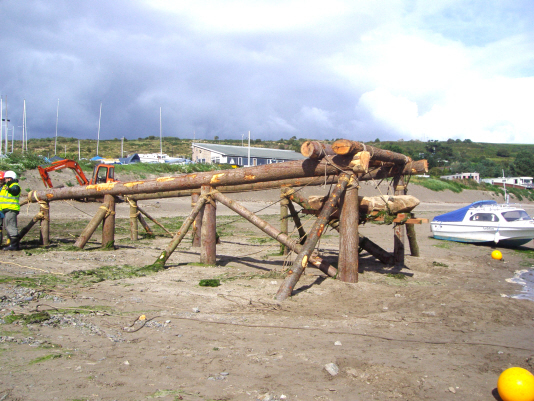 The remains of timber roundhouses reveal how timber was strung and stitched together. Under the direction of a film crew working for the state-side Discovery Channel, not a single multicoloured pullover bearded archaeologist was harmed during this risky undertaking, primarily because none were employed. 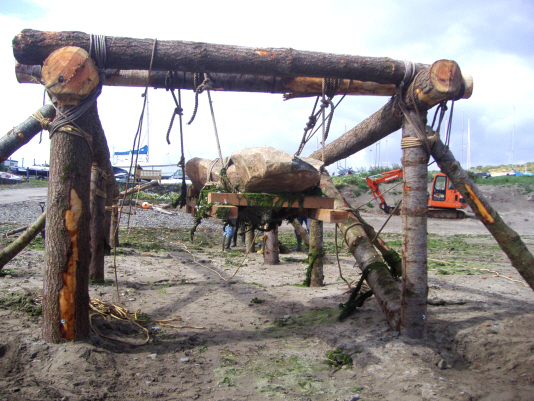 Instead, the company wisely sought out highly skilled local craftpeople, Nick, Dougie and Paul, time-served in the construction and repair of wooden boats including one (www.Keewaydin.com) weighing in at over 100 tons, and having much experience of building large wooden structures for maneuvering seemingly unfeasibly heavy weights. They delivered the goods with utter confidence and without fuss. The spectacle was a joy to behold. The question is an important one, because if moved by the hand of man, it poses some humdinger other questions about the capabilities and intentions of the Stonehenge builders. These are uncomfortable to mainstream archaeologists, many of whom lie awake at night racked with anxiety whenever the present rather cosy model of Neolithic life is threatened by increased reality. This ‘bluestone argument’ has recently been reactivated through the work of a team of geologists and archaeologists whose most well-known spokesperson, the amiable Professor Mike Parker-Pearson (Sheffield), oversaw the excavation of a buried and large megalith from a lowland outcrop on the northern side of the Preselis near Pont Saeson, near Brynberian, in 2011.Although not a classic spotted bluestone, this beast’s geology exactly matched that of the nearby outcrop and also matched the chemistry of several others of the “non-bluestone bluestones” at Stonehenge. The theory is put forward that, based on the evidence so far, no ice-age could have moved this stone or other ones from this site over the Preselis to Stonehenge. That the outcrop lies adjacent to a tributary of the Nevern river also supports the theory of transport by river, then the sea, as per the now traditional theory first promoted in the 1950s by Professor Richard Atkinson (Cardiff) and described within his still remarkably comprehensive book Stonehenge (Unwin, 1956). A later edition of his book has a Byronic illustration ( by Alan Sorrell) of a raft holding a doomed bluestone and crewed by savages being lashed by a Pembrokeshire so’westerly. Now Atkinson really was old school archaeologist. Never far from a cigarette holder and always sporting a bow-tie, ‘Dickie’ Atkinson produced a classic 1950s TV re-inactment of bluestone moving using ‘multiple punts’ and other supposedly neolithic craft on a stretch of the Bristol Avon, using public schoolboys as stone-age stone movers. It was all rather Enid Blyton and Eton mess. This may appear laughably naïve to us today, yet later attempts have been far more dangerous to life and limb than this first filmed effort. Perhaps it was the lashings of ginger beer that fortified the crews on the Atkinson boats, or perhaps it was just that folk had far more common sense than today, for since then, two attempts have sent bluestones tumbling to the bottom of Milford Haven, or Neyland, and at least four people have been hospitalized with crushing and fracturing injuries as a result of attempting to lift or move these heavy monoliths. 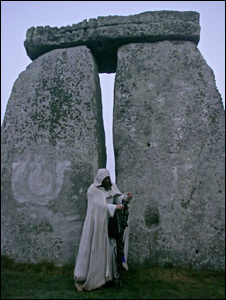 During the heady days of the new millennium, a lottery funded attempt to take a bluestone from Carn Menyn to Stonehenge became part of local folklore, and is a story that will be told to grandchildren by their grandparents for a while yet, as it contains all the tragedy, farce and comedy of a good narrative. The fated single stone now languishes in 70 feet of water opposite Pembroke Dock, where it lends support to the dangerous theory that suggests, perhaps, we have actually devolved in our abilities as a species since the Stone Age. Those who have taken the trouble to read my own contributions to the matter of Stonehenge (in books, presentations and via http://www.skyandlandscape.com) will appreciate that another question needs to be asked concerning the monument. Once they are seen to have been moved to Salisbury Plain by the hand of man, it goes beyond how the bluestones arrived there and becomes why they were so important in the monument? It is 135 miles (as the crow flies) from Preseli to Stonehenge, and these stones were not moved without some powerful driving motivation. What might that be, eh? If the glaciation theory is attenuated by this new evidence, then ipso facto the argument for the bluestones having been moved by human intent is fortified. And this then begs a really tricky ‘geomantic’ question: Might the location of the bluestones, rather than their geological composition, be a significant reason for their required presence at Stonehenge? No one in academia presently wants to get anywhere near this question, yet today’s successful positing of a fat bluestone into the bowels of a believable neolithic boat scores an important point in supporting the theory that the moving of the bluestones occurred through human intent. That being the case, why the Neolithic culture should have been compelled to undertake such a task now surely commands our utmost attention. Watch the increasing thrumming emanating from various blogs and websites manned 24/7 by researchers, zealots, seekers, bigots and unemployed folk sporting archaeology degrees. Finally, watch the documentary on the Discovery Channel when it comes out!